Philippa Lynne Howden-Chapman QSO is Professor of Public Health at the University of Otago, and director of the New Zealand Centre for Sustainable Cities. Howden-Chapman started her career in secondary-school teaching, before moving to clinical psychology, and ending up in public health. She has conducted a number of high-profile randomised control trials into various aspects of housing and health, in the process helping to build the evidence base for the later New Zealand-wide insulation programme. Howden-Chapman's Healthy Housing group conducted an analysis of the Warm Up New Zealand: Heat Smart programme which showed that overall it "will have a net benefit of $951 million dollars, and a highly favourable benefit cost ratio of 3.9:1." Howden-Chapman was a member of the 2012 Expert Advisory Group on Solutions to Child Poverty, which outlined a number of policy recommendations to tackle child poverty in New Zealand. In November 2013, Howden-Chapman was made a fellow of the Royal Society of New Zealand. In December 2014, Howden-Chapman and her research programme were awarded the $500,000 Prime Minister's Science Prize. She was the first woman and the first social scientist to win the prize. Howden-Chapman is the current chair of the WHO Housing and Health Guideline Development Group. She is also director of He Kāinga Orana, the Housing and Health Research Programme examining the link between housing quality and health, based in the University of Otago, New Zealand. With a strong interest in reducing inequalities in the determinants of health, Howden-Chapman's research aims to identify and evaluate housing-related interventions to improve individual, family and community health. Her research has had a major influence on housing, health and energy policy in New Zealand. Howden-Chapman was named the Supreme Winner of NEXT Woman of the Year 2018 for her advocacy for healthy, warm and dry homes in New Zealand. 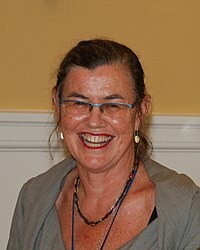 ^ "Public Health Champion 2006 – Philippa Howden-Chapman". Public Health Association of New Zealand. Retrieved 31 August 2013. ^ "Dame Joan Metge Medal". The Royal Society of New Zealand. Retrieved 13 October 2013. ^ "The Liley Medal". Health Research Council of New Zealand. Retrieved 13 October 2013. ^ a b Morton, Jamie (2 December 2014). "Prestigious science prize awarded to housing champion". The New Zealand Herald. Retrieved 7 December 2014. ^ "New Year Honours 2009" (14 January 2009) 4 The New Zealand Gazette 87. ^ "Philippa Howden-Chapman". New Zealand Centre for Sustainable Cities. Retrieved 21 July 2013. ^ a b c "Professor Philippa Howden-Chapman, Department of Public Health". University of Otago. Retrieved 21 July 2013. ^ "Evaluation of Warm Up New Zealand: Heat Smart". Healthy Housing / He Kainga Oranga. Retrieved 13 October 2013. ^ "Solutions to Child Poverty". Office of the Children's Commission. Archived from the original on 22 May 2013. Retrieved 13 October 2013. ^ "Leading Otago researchers elected as Royal Society Fellows". Otago University Bulletin Board. 21 November 2013. Retrieved 18 November 2014. ^ Royal Society of New Zealand (20 November 2013). "Top researchers, scholars elected Fellows of Royal Society". dunedin.scoop.nz (Press release). Retrieved 18 November 2014. ^ Chapman, Wallace (7 December 2014). "Social scientist wins PM's Science Prize". Radio New Zealand National. Retrieved 8 December 2014. ^ a b "Professor Philippa Howden-Chapman – Healthy Housing – He Kāinga Oranga". www.healthyhousing.org.nz. Retrieved 9 October 2018. ^ "NEXT Woman Of The Year 2018 Revealed". Now To Love. Retrieved 12 October 2018.